Notebook Day: What is Bullet Journaling? 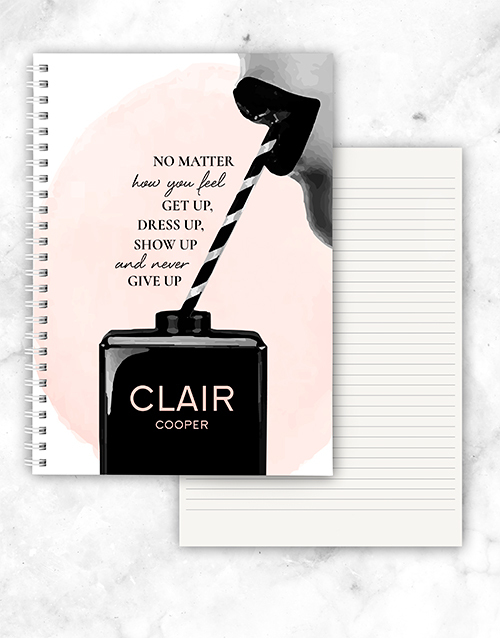 Encourage a loved one with this A4 or A5 blank notebook which features a unique ‘No matter how you feel’ cover design which is personalised with a name. It’s the perfect gift for anyone who loves to jot down their thoughts! According to various studies, language learning has a positive correlation with intelligence. Journaling gives you the chance to explore language in a meaningful way. If you spend a lot of time writing, you will eventually find the need to expand your vocabulary in some way. The extent of one’s vocabulary is often directly related to a person’s intelligence. A journal becomes the context of your dreams. A journal is not only where you record your insights and inspirations, it is also where those insights become solidified and real. The ‘achieving goals’ aspect comes into play once you begin strategising a plan to execute those insights and ideas. Writing your goals down signals to your brain that ‘this is important’. Your brain will, therefore, flag any opportunities and tools to achieve that goal. 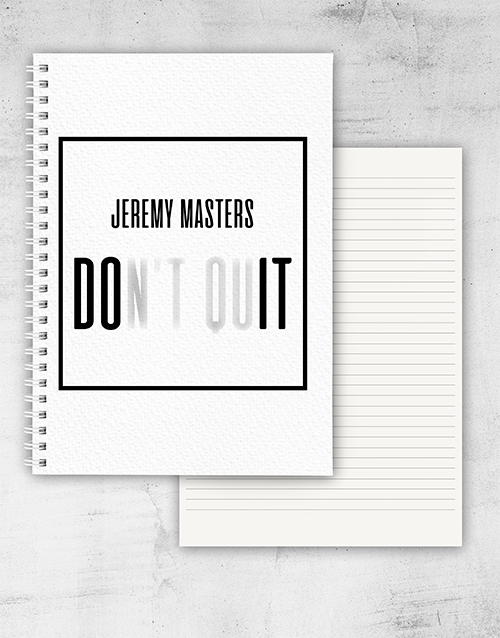 Encourage a loved one with this A4 or A5 blank notebook which features a unique ‘Don’t Quit’ cover design which is personalised with a name. It’s the perfect gift for any occasion! We’ve already discussed the benefits that journaling has on your IQ, but let’s take a look now at the benefits it has on your EQ. Among other things, EQ relates to your ability to perceive and manage your emotions, as well as that of others’. By journaling, you are working through your emotions and are, therefore, increasing your self-awareness. This internal familiarity will help you to relate better to others. Translating events into language can actually affect the brain and immune functions. It helps lower stress levels, reduces anxiety and depression. By describing negative emotions in moderation correlates with improved health. Once events are organised, they become smaller and smaller, and then they eventually become easier to deal with. 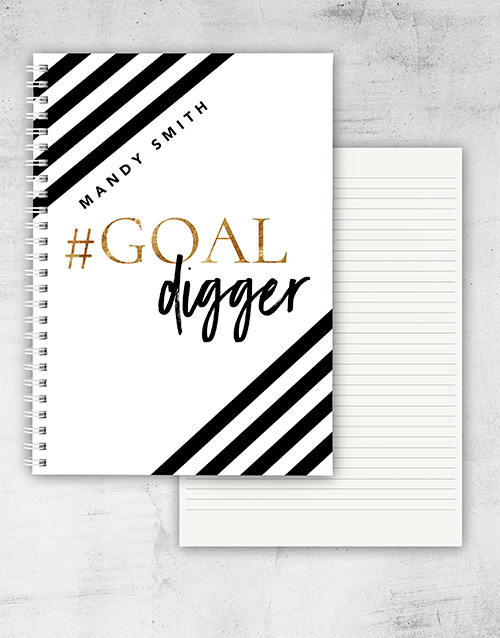 Help them reach those goals with this A4 or A5 blank notebook which features a unique ‘#GoalDigger’ cover design which is personalised with a name. It’s the perfect gift for anyone who loves to jot down their thoughts! Writing brings out thoughts and ideas that you never even thought you had. Journaling helps you exercise those expressive muscles. Practice free thought writing when you can. Giving yourself the opportunity to think freely without judgement will improve your ability to generate ideas. 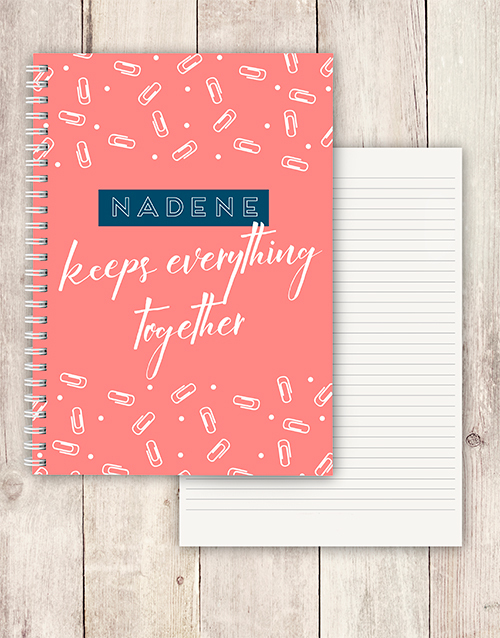 Product Description: Spoil that organised someone with this A4 or A5 blank notebook which features a unique ‘Keeps everything together’ cover design which is personalised with a name. It’s the perfect gift for any occasion! Write an “x” over the bullet to mark to-dos that are now complete. Write the greater than symbol over it (>) to show that the task has been “migrated”. This means that you didn’t finish it today/this month and that you’ve therefore moved it to another day/week/ month list. Use a dash for quick thoughts, notes, or smaller events. Write an open circle to mark big events. Whatever way you look at it, journaling is beneficial. It has a way of organising your thoughts, processing your feelings and achieving your goals. The process helps clear the mind and keep calm in times of chaos. It helps with memory retention and comprehension. It just helps. 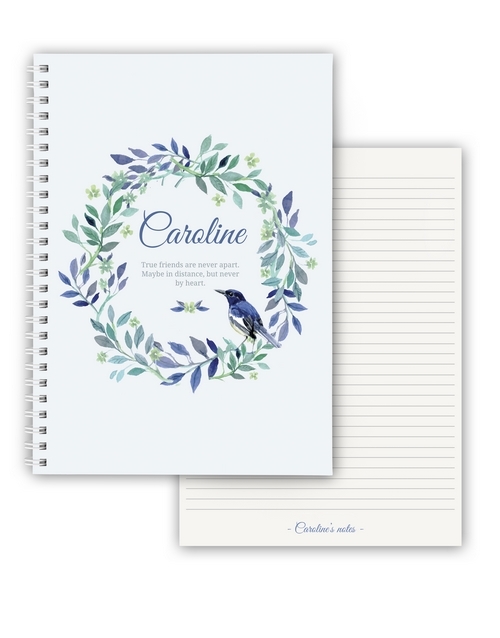 NetFlorist also helps in that it delivers personalised stationery (journals, notebooks, pencil cases and more) to customers, nationwide! Do it now. Place your order and try your hand at journaling this Notebook Day! Show a true friend how much you value them with this special gift. This A5 or A4 60-page blank ring-bound notebook is branded with a unique friendship cover design, which is personalised with a name. Make your bestie’s day with this special gift! Your fill of dandy Daffodils!